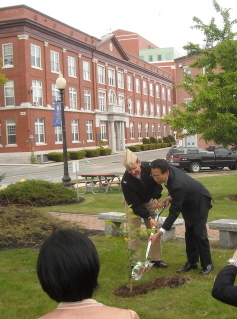 Portsmouth, New Hampshire (2013) –The Japan-America Society of NH has launched a project to create a living memorial to the Portsmouth Peace Treaty in the form of cherry trees descended from the iconic Washington DC cherry trees. Those trees, that are the focus of the famous annual Cherry Blossom Festival, were a gift from Japan to the United States in 1912 in thanks for the American role in orchestrating the diplomacy that led to the signing of the Portsmouth Peace Treaty, in Portsmouth in 1905. Funding for the project comes from the Japan Foundation Center for Global Partnership, headquartered in New York, which awarded just under $10,000 from its Grassroots Exchange and Education program. Last year, during the 100th anniversary of the gift of the cherry trees, the Japan America Society of New Hampshire arranged with 32 other locations nationwide to be honored with the gift of cherry tree saplings descended from the originals. In 2012, four symbolic trees were planted at the iconic sites of the Portsmouth Peace Treaty Trail: the Portsmouth Naval Shipyard, where the Treaty was signed; Wentworth By the Sea Hotel where the diplomats stayed; Strawbery Banke Museum, where the Shapiro House is a representative of the citizen diplomacy at work in Portsmouth in 1905; and the John Paul Jones House Museum where the exhibit on the Portsmouth Peace Treaty is installed. At the end of the program, JASNH was entrusted with all of the remaining trees that are now being nurtured by the state Division of NH Forests until they are large enough plant in public spaces. The City Tree Committee is examining other potential sites for planting some of the trees. In May, in conjunction with the blossoming of Portsmouth’s Nichinan Sister City cherry trees, the Japan-America Society of NH hosted the first annual Cherry Tree Festival event on May 11, 2013 at Wentworth By the Sea Hotel, featuring the Washington DC-based author of The Cherry Blossom Festival: Sakura Celebration, Ann McClellan, the authority on the history of the DC cherry trees. She presented an illustrated talk in the historic Grand Ballroom of the hotel, where the Japanese hosted an appreciation banquet the night before the Treaty was signed. A tea reception followed. JASNH has also begin to place commemorative granite plaques at the sites of the cherry trees planted in 2012. In addition to Portsmouth, several of the towns that have hosted Atty. Doleac’s NH Humanities Council talk on “Teddy Roosevelt’s Nobel Peace Prize” have asked for cherry trees. In return they agree to take care of the tree, to share the Teachers Guide to the Portsmouth Peace Treaty created by New Hampshire schoolteachers (including Assistant Mayor Bob Lister) in 2005 and to celebrate Portsmouth Peace Treaty Day on September 5th by ringing bells, as Portsmouth does. Alternative strains of cherry will be selected for sites where the climate is too harsh for the yoshino cherry trees from Washington. For more information on the Portsmouth Peace Treaty and the citizen diplomacy mapped by the Portsmouth Peace Treaty Trail, please visit www.PortsmouthPeaceTreaty.org The Portsmouth Peace Treaty exhibit at the John Paul Jones House Museum opens for the season May 1st and will be open 7 days 11-5, through October 31. Free copies of the Portsmouth Peace Treaty Trail map are available at the Museum, Wentworth By the Sea, the Greater Portsmouth Chamber and the Discover Portsmouth Center.